but it's nice to be prepared, right? 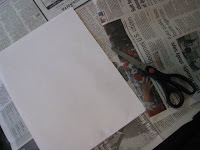 I used a sheet of computer paper as a template to cut apart an old newspaper. Then I typed out the letters making sure to leave a lot of space between each one. I chose a different font for each letter. To get the right size, I chose to make the font sizes between 145 to 175. When I was satisfied with the look, I ran the newspaper sheets through my printer. All that was left was to cut squares around the letters and attach them to the back of the frame with tape, then reassemble the frame. I told you it was cheap, quick and easy! Have a wonderful weekend! Wish I could find white pumpkins at the Dollar store here. No such luck. Love it! I feel like I have a personal decorator. I simply tune in here and you have great projects waiting for me. Better than HGTV. Have a great weekend. And it's never too early to think about Halloween decorations. LOVE This!!! I'm going to have to make a trip this weekend the the dollar store after all the blog chatter about it! Gosh Joy...you have so much imagination...I am still hunting down crows from the dollar store and no one has them...It seems everytime I go to the dollar store to get what some of you show they don't have it at my...Guess that is why mine is in a small town...you all must buy them out. 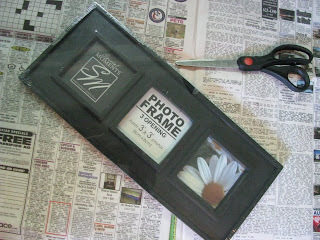 Oh well love the idea and will look for the frames this weekend. I love this idea! I just found your blog and I love it! Thanks for sharing your creativity with us. Cute! I love the "eek" one! I love you thrifty, crafty ladies! 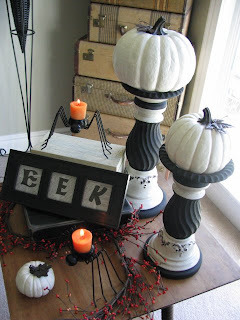 Very cute idea - I like the "eek" one. If you could find a four picture one you could spell out "home" or "nest" - that would be could all year round. I love what you did with that frame! It is so cute and fun! I hope you have a fall open house so all your family can view and "awww"! What Dollar STore are you going to, I've hit three in our podunk town and...well.....I left with no fun stuff like you guys all have. Wahh! I get my goodies at the Dollar Tree. I've learned that if you see a dollar item on someone's blog, it pays to call and talk to the manager about the item. I had to hunt down the crows that Susie Harris had on her blog. It turns out that all of the dollar stores in my area still had them in the back room, waiting to put them out! Okay, now I'm going back to the Dollar Store. Great, great, great idea. I absolutely love this. The old newspaper for the background is great. How absolutely darling is that?! Just love the dollar stores. The closest one is about 50 minutes away, but at least it is close to my in-laws. Maybe my husband feels like visiting his parents soon! Love it. Now I've gotta go shopping! Where did the candle/pumpkin holders come from? Here you go with yet another very clever and cute idea...I just may need to head to the dollar store soon! Thank you Joy! !...I just went thru Dollar Tree here in town a few days ago and did find some really really nice fake apples, but no crows and no berry rings. I'll keep watching tho. I did find my crows at Michaels, I live to copy all you smart cookies. LOL...have a good weekend. FABULOUS Eek frame! I'll be linking to this project! Really cute, Joy! I love your whole vignette. 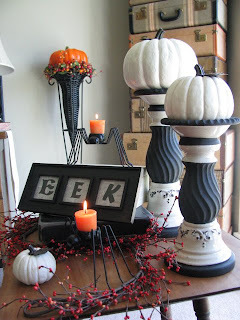 I just did some white pumpkins for my foyer table, I'll be sharing next week. Joy, question for you...did you find that Sea Glass spray paint at Lowes?? Or where? I'm looking for that color & it's not at my Lowes. Maybe Walmart? I love that one. I've seen a few other aqua colors, but yours is a nice one. I've got an aqua spray paint project coming up! I'll be your brain is the size of MONTANA! Your project is adorable! I just did a post today using my Dollar Tree stuff. This may sound like a dumb question...but how do you increase the font that big? I thought most of them went only to 72. Yep, that was BOOtiful!!! I'm heading to the dollar store.....thanks for the ideas. Hi, Joy. I found your blog from a link from somebody else's blog. I gotta tell you that I just love your stuff! Looks like I'm gonna have to look around for some fall decor! If you want a larger size font than what's available, you click on the font button then type in a higher number then push enter. Stop! I'm getting addicted. What a clever idea. Love it! I love the Boo one...I am going to have to do that! How cute!! I'm going have to do this one! OK seriously, that is adorable!!! I went last week and stocked up on pumpkins, now I need to go to get frames! You have such great ideas!!!! cute table arrangement and more great ideas! What an amazingly brilliant idea! I never would have thought to print on newspaper!! You never fail to amaze me! Girl, Where do you store all of your stuff when out of season? You must have oodles of bins!! I really MUST get to the Dollar Store. Thanks for sharing! The dollar store should hire you. What great ideas, and so inexpensive. Even the spray paint company's should read your blog for new ideas!!!!! I was at the dollar store today and saw the frames and went about my merry way. Guess I'll have to go back.Thanks for sharing such a great idea ! Very, very cute! I love Halloween and I love the colors of fall. I need to get decorating! Saw this and immediately thought of you! Very cute idea and I love the dollar store too! What a great post! Even our very small town has a Dollar Store. I'm on the way! Wow, I gotta go to the Dollar Store! My kind of project, cheap and quick! Gotta love it! Hey Joy! I got my frame done....and gave you credit, of course! FUN! I'm going to the Dollar Tree today and I am going to do this little festive piece for sure! Great job! I love your mantle.. so pretty and cozy! Where did you get those candles.. so sweet! SO CUTE!!! And, you can change out for Christmas with JOY!!! Hey, Joy, NO...I didn't find that Sea Glass at my Lowes. Maybe another one might have it, but I think I found a good sub at Hobby Lobby, so I'll get some of that today. It looks to be very similar. It's raining today, so I may not be able to get it done until the weather dries up. Can't wait to turn them aqua! Joy, I love your blog~you have great taste and are creative beyond creative. I did this little project over the weekend with scrapbook paper~thanks so much for the inspiration! Found you through Rae...just LOVE the idea! TOO CUTE! Love the accessories with the frames too! Great ideas for Halloween party table decorations! Thank you. Cute. I am so doing this..
Oh lordy, you are so clever!!! I have to try this! can u tell how excited I am??? I will definitely have to add you to my blogroll, if you don't mind of course. 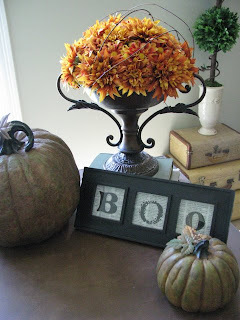 Joy -- My daughter pointed me to your blog and the really cute dollar store Halloween tablescape you did. WHAT AN INSPIRATION!! She gave me two ceramic pumpkin and goard from Kohls that was the base to my tablescape. After visits to two different $1 stores, I accumalted a lot of things to include in my creation. 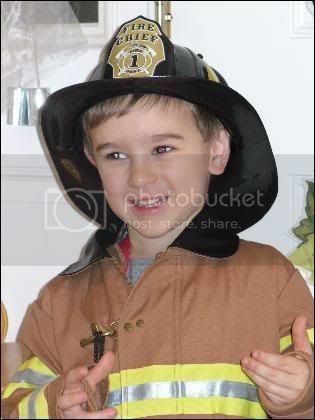 I also found a frome (four pictures) that I used to create the word FALL. I printed it out on some decorative cardstock and brayered fall colors onto the white mat and added some stamped images of pumpkins, fall fruits and leaves colored with my markers. It all turned out really nice and I'm so proud of myself!! Thank you for your inspiration!! 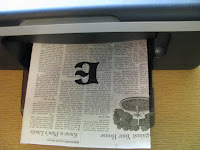 I just LOVE this idea - one question, did you run just one sheet of newspaper thru the printer? or did you attach it to a heavier piece of paper, then run it thru the printer? I went last night to Walmart and found a 3 opening black frame for only $2. I'm excited to finish my little project tonight! Thanks for the GREAT ideas! I just found your blog and it is the BEST!! Check it out if you get a chance and let me know what you think! I just love your blog. You are so creative! I made the BOO 3-frame project today and posted it on my blog. Thanks for the inspiration! Thanks for the inspiration - I posted my 3 opening frames today! I loved this so much that I copied it. And when I say copied it, I mean pretty much EXACTLY copied. Thanks for the idea! I finally got a photo of my "BOO" frame posted. Thanks for the inspiration for fun and easy projects! I would love any advice you have on how to become as famous as you have.